Francis Bailey is my favorite Revolutionary War printer. He was defiant. He was radical. He fought British taxes with his press. He was anti-Federalist in a Federalist Lancaster County. He was Swedenborgian, when his neighbors were Presbyterian and Mennonite. Francis Bailey was a rascal. Francis Bailey is the perfect Scots-Irish symbol of a revolutionary American free press. He is one of Lancaster's greatest claims to letterpress fame. Francis' family had deep roots in southern Lancaster County. Francis learned the printer's trade from Peter Miller, at the Ephrata Cloister. Francis then set up shop in Lancaster, at the site of today's Lancaster Newspapers. We bibliophiles have an obsessive lust for firsts: First editions, First printings, First American editions, First Australian editions, First illustrated editions, First thus editions.... Fortunately, Francis Bailey has lots of Firsts. The first printer to name George Washington, in print, as the Father of His Country. The first printer to print the first edition of the first major book of poetry of the "Father of American Poetry," Philip Freneau, who was also known as "The Poet of the Revolution". The first printer to print the first publication (A Sermon on Tea) of Lancaster-born David Ramsay, an important historian of the American Revolution. The first printer to print government securities certificates for the first opening of the New York Stock Exchange in 1792. The first printer to print in America the works of Swedish mystic Emanuel Swedenborg ...helping Johnny Appleseed (of cooking-pot hat fame) become a Swedenborgian missionary. 1735? - Octorara, Lancaster County: Bailey is born in Sadsbury Township, Lancaster County, into an old Scots-Irish / Presbyterian family. His parents are Robert Bailey and Margaret McDill Bailey. 1771 - Lancaster City: Bailey opens a print shop in Lancaster. 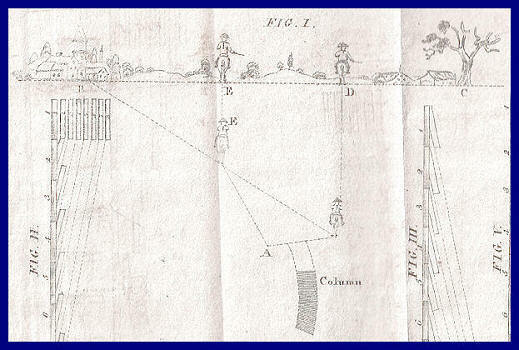 1773 - Lancaster City: Bailey begins printing on West King Street, at the site of today's Lancaster Newspapers. He prints here until he moves his business to Philadelphia circa 1780. 1776 - Lancaster City: Bailey prints an early edition of Thomas Paine's Common Sense, the first American publication to openly call for independence from England. The first edition had been published anonymously in Philadelphia, earlier that same year. 1777 - Lancaster City: Bailey prints the first official printing of the Articles of Confederation, which is the first constitution of the U.S. The next year he prints these Articles in German, titled Artikel Des Bundes...This is probably the first German-language printing. 1778 - Lancaster City: Bailey prints a short-lived newspaper: Das Pennsylvanische Zeitungs-Blat (The Pennsylvania News Sheet) He calls himself Frantz Bailey in this newspaper. Frantz uses this newspaper mainly to tell Lancastrians about the British occupation of Philadelphia. Also in 1778 - Lancaster City: Bailey is the first to name George Washington "Father of his County, when the cover of Bailey's 1779 almanac calls "Waschington" "Des Landes Vater." 1779 - Philadelphia: Bailey prints and publishes the United States Magazine, edited by York-County native Hugh H. Brackenridge. Philip Freneau, know as "The Father of American Poetry" contributes poetry to each issue. By 1780 - Philadelphia: Bailey opens a full-time print shop in Philadelphia on Market Street between Third and Fourth Streets. His print-shop sign is a painting of a skull: the skull of Shakespeare's Yorick ...made famous by Hamlet's skull monologue. Bailey's Philly imprints say "Printed by Francis Bailey at Yorick's Head." 1781 - Philadelphia: Bailey begins printing and publishing his infamous Freeman's Journal newspaper. This newspaper is stridently anti-federalist. Meanwhile, Lancaster County is stridently Federalist. 1786 - Philadelphia: Bailey prints the first collected edition of the poetry of Philip Freneau who is "The Father of American Poetry." The book is titled The Poems of Philip Freneau. Written Chiefly During the Late War. 1792 - Philadelphia: Bailey buys the type-founding equipment used by Jacob Bay of Germantown, near Philadelphia. 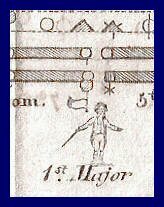 Bay was the Swiss-American type founder who had become one of the first American typefounder in the 1770s, after working for Christoph Saur II. Bailey had purchased much of his type from Bay. 1797 - Octorara, Lancaster County: Francis Bailey's father transfers the Bailey homestead in Octorara to Francis, two years before the father's death at age 90. Francis Bailey builds a print shop here, and continues on as the official printer for the State of Pennsylvania, until his death in 1815. 1800 - Lancaster City: Francis and his son Robert print numerous books here, including Pennsylvania's Acts of the General Assembly and reports of the state House of Representatives. By 1803 - Lancaster City: Bailey has transferred his Lancaster printing business to his son, the printer Robert Bailey. 1812 - Philadelphia: McCulloch describes Bailey: "He is a very aged man, has often the vertigo, and is not often to be seen. He was bred a carpenter, in Lancaster county. He obtained some knowledge of printing in a country town." 1815 - Philadelphia: Bailey dies. His daughter-in-law, Lydia Bailey, and his grandson, Robert William Bailey continue their own printing business. Bailey Poses for his Portrait: Bailey's 1791 portrait is at the Cincinnati Art Museum. It is by Charles Wilson Peale. Bailey holds a letter "A" in his hand. (You might not be able to see the "A" unless you Photoshop it.) Bailey has big ears. Mrs. Bailey Holds a Book: Mrs. Francis Bailey was Eleanor Miller Bailey, formerly of Bart Township, Lancaster County. Her 1791 portrait is also at the Cincinnati Art Museum. Bailey's 1775 Lancaster Broadside about the Battle of Bunker Hill. It's boring typography, but it's not boring history. Swedenborgian Church names a Building for Bailey: Urbana College, in Ohio, built "Bailey Hall" in 1853. Bailey was a Witness to Ben Franklin's Will. This is the text of Ben's will. Bailey Prints Another Revolutionary Broadside in 1776: This one is signed by Matthias Slough, one of Lancaster's most ardent revolutionaries. Slough also was Lancaster's most prominent innkeeper. His White Swan tavern was located where today's Watt and Shand building is located. Bailey Prints a New Testament, but Only One Known Complete Copy Survives: In 1780, Bailey printed an English-language New Testament in Philadelphia. The Houston Baptist University has the only known copy. Francis Bailey didn't just print Revolutionary War / Firebrand pamphlets. He also printed mild-mannered Pietism pamphlets, like this rare imprint. 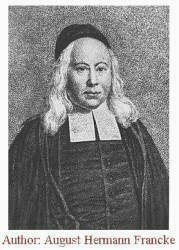 The Halle Institutions were founded in 1698 by this pamphlet's author, August Hermann Francke, a godfather of Lutheran Pietism. The University of Halle, with its associated Halle Institutions, was one of Europe's great centers of learning. The university was an early center of German Enlightenment and liberal academic freedom, making it one of the first modern universities in Europe. F&M College's first president, Gotthilf Heinrich Ernst Muhlenberg, was only 10 years old when his Pennsylvania parents sent him to Germany to Francke's school in Halle, where Gotthilf stayed for eight years. Henry became fluent in Hebrew and Greek, there, in addition to his automatic English and German. Gotthilf's older brother Frederick also studied at Halle, and went on to become the first U.S. Speaker of the House of Representatives. 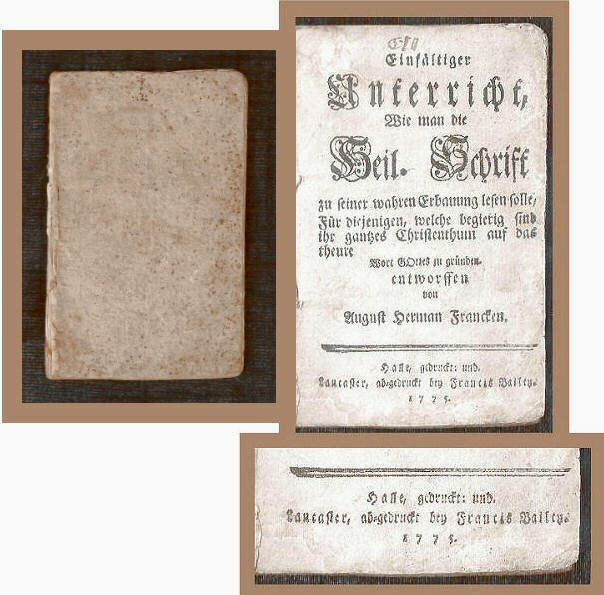 By the time Francis Bailey printed this rare little book in 1775, Gotthilf Muhlenberg had returned home to Pennsylvania from Halle. Gotthilf would have been in his early 20s, and would have to wait 12 more years to become the first president of "America's first German university." Today this F&M College is one of the great American private colleges. The school is multi-lingual and multi-cultural, and is a cornerstone of Lancaster's multi-ethnic communites. This rare Francis Bailey imprint is un-recorded. (No one knows he printed this, except you!!) I have not located another published reference to this printing. O.K. It was un-recorded until I told you about it here. Now I need to find one signed and inscribed by Francis Bailey to Henry Ernst Muhlenberg, in 1775, with Henry's thank-you letter laid-in looseleaf. Other Links: Hermann Francke's "Halle Institutions" school is Here. Today the school is called the Frankesche Stiftungen / Franck Foundations. 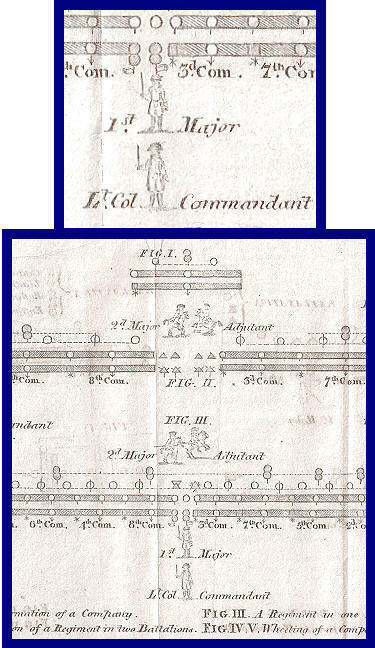 In 1802 Francis Bailey printed an edition of the landmark book that is the first American militia training manual. This book had initally been published in Philadelphia by Melchior Steiner and Carl Cist, in 1779, on order of Congress. 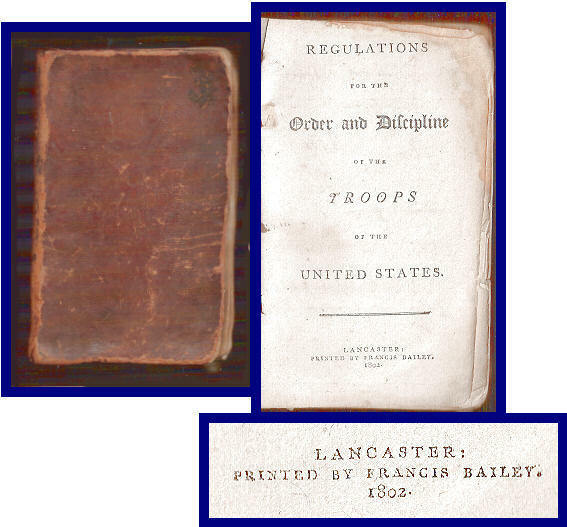 The great demand for this book by the state militias convinced Bailey to print his own edition. This book was written by Baron von Steuben, the great Prussian officer who helped George Washington and the American troops win the Revolutionary War. Bailey bound this Von Steuben manual with An Act for the Regulation of the Militia of the Commonwealth, which he also printed in 1802. Five years later the Lancaster printer John R. Mathews printed this same two-part publication. Bailey's and Mathews' editions both include eight engraved illustration plates, as I show here. P.S. Steiner and Cist are also remembered for printing the first broadside, German-language edition of the Declaration of Independence, in July 1776. The most important item ever printed in Lancaster County is the Articles of Confederation, printed in 1777 by Francis Bailey. (Although, for me and for many bibliophiles, the Ephrata Martrys Mirror and the 1819 Baer Bible are personally more interesting.) Bailey's Articles of Confederation would certainly be the most expensive item ever printed in Lancaster County, if Williams College in Massachusetts ever sells it. Francis Bailey printed 300 copies of a 26-page pamphlet that would become the greatest legacy of his printing career. This document was the first constitution of the United States. Bailey printed this work for members of the U.S. Congress, who were meeting nearby in York, where Congress had relocated from Philadelphia, because of the British occupation of Philadelphia. 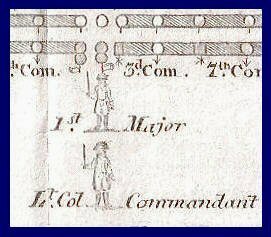 On November 15, 1777 the Continental Congress has approved these Article, at York. Congress instructed Bailey to print 300 copies. So he did. ....He printed a beautifully-ornate document that is now one of the most important founding documents of the United States. Other printer had printed early, preliminary versions of these Articles in 1776, but Bailey's printing was the first printing of the completed Articles. Later that same year, other printers throughout the states printed their own editions. Today there are only a few surviving copies of these Articles, including preliminary printings from 1776, and completed ones from 1777. Williams College has one of the Francis Bailey printings. The college library display's Bailey's document in an exhibition hall, in a display they call Founding Documents of the United States. The college web site says "The Articles of Confederation are the most sumptuously printed major American document of the 18th century, and of the nine extant copies none is more perfectly preserved than that in the Williams College shrine of the Founding Documents." The Williams College exhibit, with Bailey's Articles of Confederation, is here. An image, with history, of Bailey's Articles is Here, at Philly's Pennsylvania Historical Society. 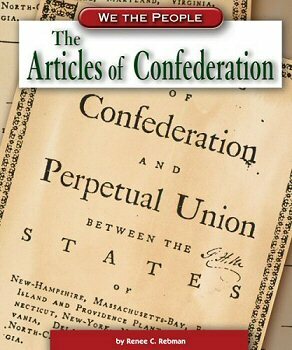 A good history of the printing of these Articles of Confederation is here. The National Archives' information about the Articles of Confederation is Here, with a link to the manuscript edition that is signed by all the state representatives in 1781, when the Articles were finally ratified, to be the first constitution of the United States. In 1787 the U. S. Constitution replaced the Articles of Confederation as the official frame of our government. That Constitution is Here. 18th century Pennsylvania currency was a veritable jungle of botanical illustration. Ben Franklin was the first printer to print leaves on Pennsylvania currency. Apparently he cast these botanical designs by pressing the leaves into plaster of Paris, to create a mold for casting the leaves in type metal. Philadelphia printers decorated our bills with willow, betony, sage, raspberry, filbert, elm, maple, carrot, mulberry, climbing fumitory, poterium, parsley and more. 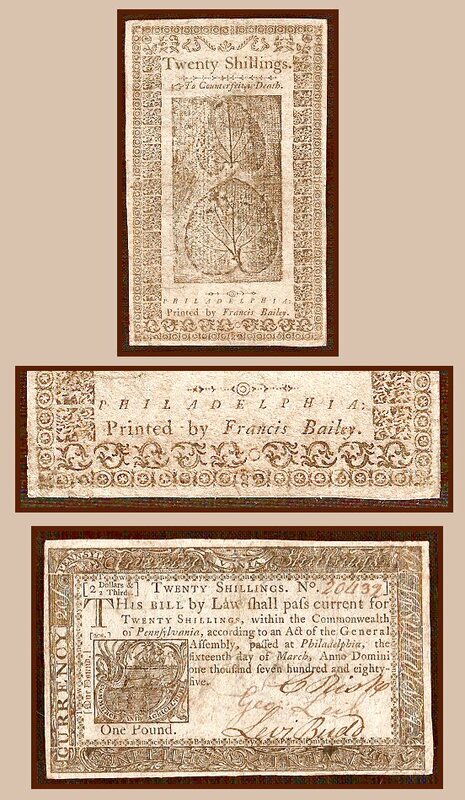 Pennsylvania was one of the last provinces to print its own banknotes, and Francis Bailey has the claim to fame of printing the last printing of these bills, in 1785, as I show here. He squeezed as many ornaments and cuts as he could, onto the paper, in an attempt to foil counterfeiters. Another ex-Lancaster printer, John Dunlap, printed 1781 currency in Philadelphia, Here. And, while I'm at it, one of my favorite leaf prints is Ben Franklin's 1760 five pound note, Here. ...and Hall and Seller's sage leaf plucked from someone's backyard garden in York is Here.